Today (August 16th) is my birthday! I turn 19 this year. I always do my nails in some of my favorite styles for my birthday every year, so here is what I decided to do for my 19th! Keep reading for more details about this mani! 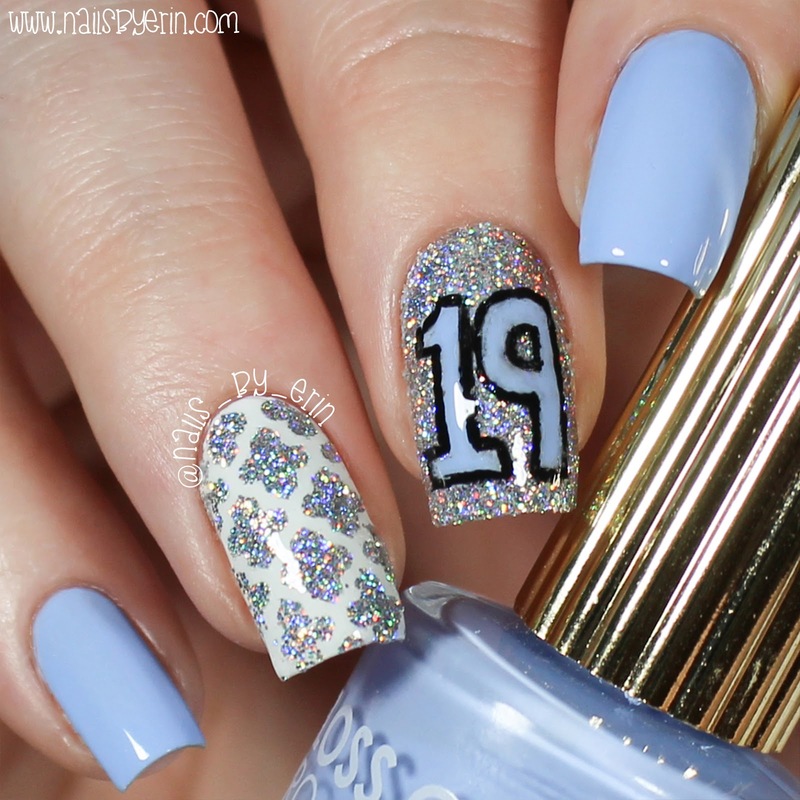 Blue and silver is one of my favorite color combinations for nail art. I had such a hard time deciding this year if I wanted to do silver and purple, or silver and blue, but since last year I used purple in my birthday nails, I decided it was time for another blue birthday mani! I started with Floss Gloss "95% Angel" on my thumb, index finger, and pinky. Then I used Starrily "Ultima" for the base of my middle nail. I also used a Snail Vinyls moroccan nail vinyl on my ring finger. If you have been following my blog for a while, you'll know that these vinyls are one of my all-time favorites!! I highly recommend them. Over my glitter middle nail, I freehand painted the 19 with "95% Angel" and outlined it with black acrylic paint to make it stand out more. I topped everything with Seche Vite top coat. I did not film a tutorial for these nails, but they are basically the same design as my blue and silver quatrefoil nails. You can watch the tutorial for that here. You have done such a great job. I like nail art but I can never do mine with such finesse. The blue and silver looks perfect. Happy birthday! This nail color pattern is very nice. I wish if you had shared a video tutorial for making this design because i really loved it. Excellent website you have so much cool information!.